A while ago my dad mentioned that he fancied doing another 10K run, but he just has so many weekends booked with tennis things, so the few that I knew and liked (like the fab Ware 10k/ 10 mile) were on days he couldn’t do. 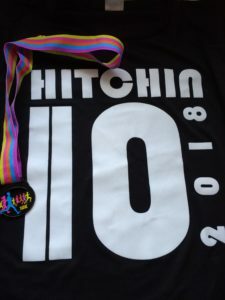 By chance I was chatting to a member of our running club and she mentioned the Hitchin 10k. 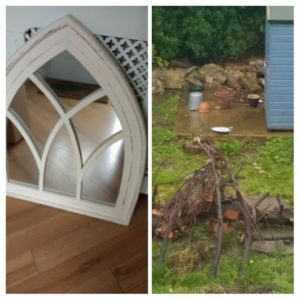 It turned out to be a day we could both do, so we signed up and ran it together. It was the best kind of race in my opinion. You could either collect your numbers the day before, or on the morning of the race. On the Saturday and and I headed to Wimpole so I could spend my vouchers (I got a nice mirror for the garden and a little bird bath) and on the way back we stopped off so I could collect them. The guy said to me “it starts at 9, so get there at about ten to”- so much better than the races that say to arrive 90 mins before. After I had a bit of toast for breakfast, Dad picked me up and we drove to Hitchin (which according to Balcony Shirts, is “Bitchin’“). We got slightly lost trying to find a car park – we kept seeing signs but then it would not appear, so we drove around in a circle 3 times before deciding on another little car park instead. It was around the corner from the town centre, and so we had half an hour to wander around in the sunshine and chat to other runners. We were aiming for under an hour, so I kept an eye on my watch for the pace. 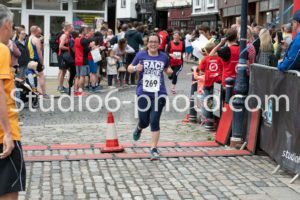 The first mile went through the town and along a narrow path, and so it was a bit busier and we were slower, but it’s no bad thing to begin slowly (and it was slightly uphill so it was fine to slow a bit). At one point we ran along a residential road with one of those speed cameras with the smiley faces- it was smiling green at all the runners and either showing 5 or 6 which was pretty accurate. I tried to take a picture as we ran but it was a bit blurry. After the residential bit we were out in the countryside for nice views and a very enjoyable run. 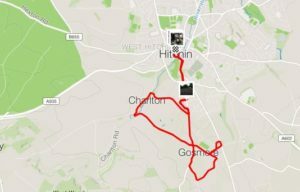 Hitchin is known to be in a hilly area, but the route was meant to avoid all the big hills, and I think it did a good job. You could call it undulating, but there were no huge hills and nothing too bad. There was one little p shaped section where runners were on the other side of the road- we had to run downhill slightly so we knew we’d be heading back up again soon. There was one water station and as it was fairly warm we stopped to have a quick drink (they had cups which always pleases me- I know some people find them harder to drink from but I feel the waste element and environmental impact of bottles only used for a sip is just so awful, plus I hate them being all over the road and tripping on them) but I was glad I only had 2 sips as I started to get a bit of a stitch after. The final mile was back down the narrow path (but the field was more spread out) so we got up a good amount of speed. As we got into the town centre I told Dad to sprint off and that I’d try to catch him, but he is way too fast at the end for that. He had finished and turned around just to cheer me in- I’m giving him a thumbs up in the photo below (he’s in his apricot parkrun t-shirt). Our splits were so close to the royal flush negative split (10:53, 9:22, 9:27, 9:16, 9:10, 8:50 and then 8:18 for the final sprint). As soon as we had finished we could collect a bottle of water from the side, get a medal and then queue up for the t-shirt. I’m actually holding Dad’s one in the photo, but I went for the female medium and it’s a good fit- loose but not too baggy. 58:41 was my chip time, with Dad being a bit ahead of me at the end, so nicely under the hour like we had hoped for. I love the medal too- it’s black metal with funky colours. We were going to get a drink before heading home, and on out way we walked past a little cafe, so decided to sit down and in the end both ordered marmalade on toast alongside our drinks. I put the t-shirt on over my top as there was a bit of a breeze and we were sat in the shade. As we sat there loads of runners kept walking past wearing their medals and t-shirts. It had such a nice feel to it- so relaxed but also well organised. I think it started a few minutes late, but I wasn’t bothered by that as it could have only been a couple. After getting home and showering, we needed to walk into town and once there I realised how hungry I was. 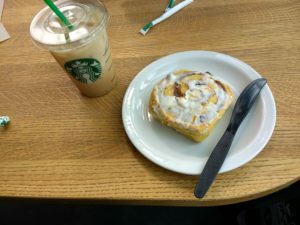 We were going to get our free drinks from Starbucks and when Andy suggested sharing a cinnamon roll I could not resist! For lunch our options at home were yet more toast, so I popped into M&S and picked up one of their lovely salads to have as a treat (they do a lovely one with roasted veggies and a sort of carrot hummus dip thing). Then it was time for more gardening. I had to build a little brick tower for the bird bath as it was just the bath bit. 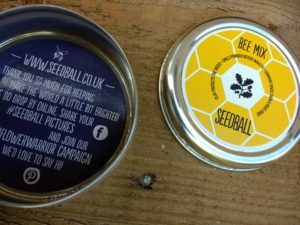 I did a lot of weeding, and then planted these seed balls- they are clever little balls with bee friendly seeds in them, coasted in chilli powder so mice and birds won’t eat them before the seeds germinate. I think all the moving about after helps to combat the post-race stiffness, but I was pretty tired by the evening- I think the crouching down whilst weeding is the most painful thing to do after a race! How do you normally recover from a race? 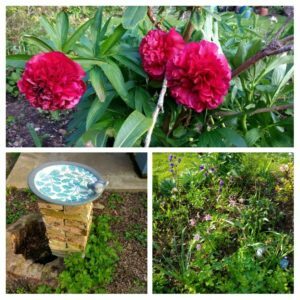 Author Maria RunsPosted on May 19, 2018 Categories General ramblings, Running, Stuff I love! Well done – sounds like a great race! My recovery usually involves eating, hydrating and, if I can, getting my legs up the wall for a few minutes. I usually like to have a nice Epsom salt bath as well. Legs up the wall sounds like a good thing to do- a bit like a shoulder stand for the relief it brings to the legs, I should give it a go. I have some of the seedballs too! I just planted mine this weekend. They are such a great idea aren’t they? So long as I don’t accidentally weed all the seedlings! Well done, it sounds like a nice day was had. Well done on the solid sub-60 10k! I love that your dad and you run together 🙂 The race sounds really nice and relaxed as well, with a great t-shirt. Love that. I tend to have a bath, foam roll and if my calves are very tight wear my compression sock. But otherwise lots of walking helps too. Thanks- it is always so enjoyable to run together. I do forget about my foam roller but I really should use it more. Walking is the best I think to keep things moving and stop you getting all stiff. 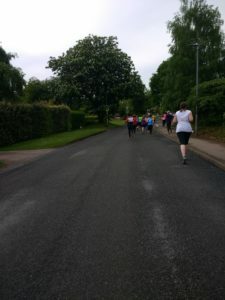 Previous Previous post: Things I’ve been loving lately including parkrun number 150! 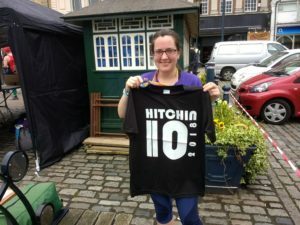 Next Next post: A parkrun countdown t-shirt!